While some 3D printer makers come a cropper trying to square the circle of making a high quality additive manufacturing machine at a low enough price for mass market adoption — likely years before those economics are viable — other makers in the space are focusing on expanding the feature-set of less affordable machines to make them stand out. Higher quality 3D printers with new features or capabilities aren’t going to drive mass market adoption until their price comes down but by continuing to push the capabilities of what these machines can do they may help to grow interest in the space. On the latter end of the 3D printer pipe, the 3D4C is aiming to be the first four-colour blending 3D printer, which will let you print objects that aren’t monotone or two-tone but rather blend quad-colours to create multicoloured plastic print-outs. The 3D4C printer has a metal hot-end extruder to blend the different colours of plastic filament, an aluminium heat bed to reduce print-out warping, and full metal parts to ensure higher levels of print accuracy. Its layer resolution is 100 microns at the highest resolution, or 500 microns at its fastest speed setting. It also includes a 0.8mm nozzle diameter — as well as a 0.4mm nozzle — for speedier (but less fine) print-outs. The machine is just a prototype for now, with its London based makers running a Kickstarter crowdfunding campaign to pull in enough funding to get the device to market. On the cost front, they’ve priced the 3D4C at £850/$1,400 plus shipping to early Kickstarter backers, rising to £899/$1,500 thereafter or even more if you want rolls of filament plus a filament rack included so affordable this is not. If they can pull in enough interest to hit their £50,000 crowdfunding target by mid September the aim is to ship to backers this December. Which does sound a rather ambitious timeline, especially given the need to tweak open source 3D printer software to support their four-colour printing function by adding a “user friendly color palette generator”. 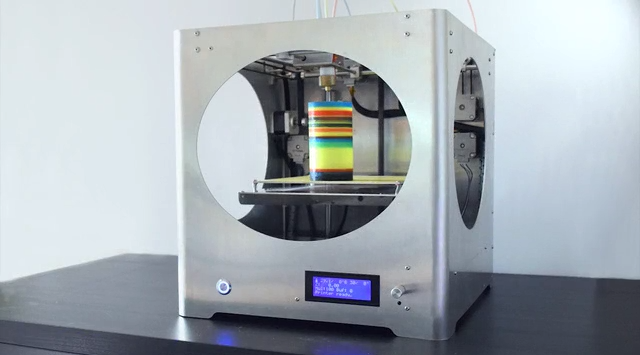 But even if this multicoloured 3D printer doesn’t make it to market, others will surely follow.